The Best Picture of the Month Competition winner for September this year is Molly Stapleton. Molly writes: ‘I bribed my little sisters into helping me with this photo. We’re dressed as the good guys and the bad guys (and also possibly the ugly guys) from my favourite film series The Three Flavours Cornetto Trilogy to celebrate the final instalment, The World’s End, being released. 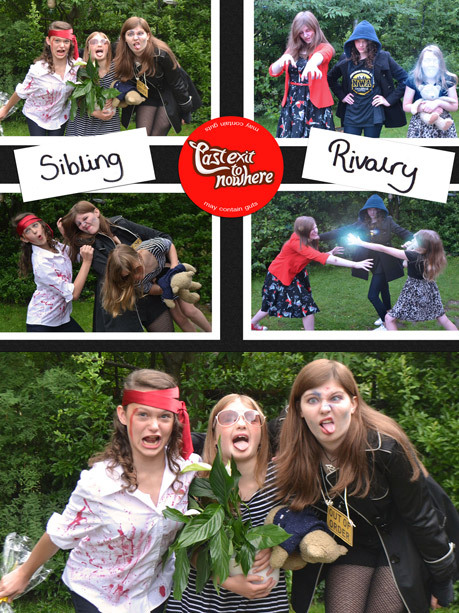 Despite one sibling getting continually distracted by a cat and the other entering her stroppy teenage phase we had such fun taking these pictures.’ Molly wins 3 Last Exit to Nowhere T-shirts of her choice. If you’d like to enter the competition this month, send your image/photo to: info@lastexittonowhere.com – all entries must contain a reference to Last Exit to Nowhere in some way.